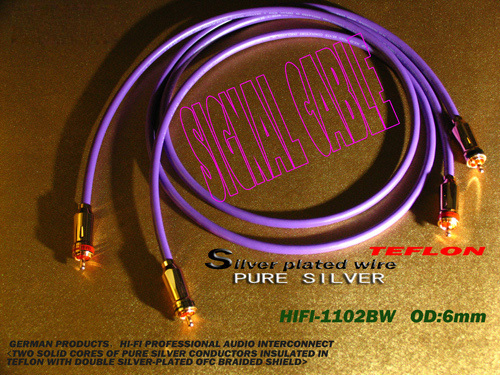 The price is for a pair of audiophile signal cables . 1. OD OD: 6 mm. 2. Conductor composition: Selection of <99.9999% pure sterling silver wire in Germany> Specification of pure silver conductor: 0.30mm 1 piece placed in conductor center 10 6 0.25mm silver-plated ultra pure copper wire, precision twisted into a round shape, two-core conductor Respectively covered Teflon media. 3. The internal structure of the wire The two core wire stranded at a large pitch after the built-in center of the wire, filled with gaps (white cotton line) and then (SHIELDED) tightly wrapped, and then use (0.10mm quality silver plating) woven tight shield , Outer jacket is purple PVC. 4. Assembly imported precision, superconducting, 24K Zijin plating, the new, lockable RCA terminal, RCA terminal head of the laser engraved on the concave groove of different notes, beautiful and unique, and with signal-enhanced protruding floating point unique Copper stylus, closer contact conduction, reducing signal transmission loss, and its signal transmission characteristics better; internal filled with transparent plastic seal, which can effectively prevent the conductor oxidation, to ensure long-term use of audio transmission stability. Equipped with imported powerful filter magnetic ring at the input end, it can effectively eliminate the interference of various high frequency electromagnetic waves, making the music background pure and noiseless, the voice more sweet, transparent, natural, true, restore more audio details, perfect match Advanced HI-FI sound system.